ScopeDome USB 2.1 control system for 2M is designed to control the domes. It consists of different elements: a stationary main part mounted at the telescope pier, which controls the rotary engine of the dome, a moving part mounted on the movable part of the dome, which controls single or double shutter, and control software for Windows. ScopeDome USB 2.1 control system is equipped with the necessary inputs that indicate the current status of the dome and the input for encoders which measure the azimuth and position of the shutter. Part of the card that controls the shutter communicates with the main part of the card through a radio transmission or by wire, using the RS 485 interface. Communication of our card with the telescope is realized by ASCOM platform 6.0 or TheSky6 sky atlas. Card is designed to work with selected sorts of weather stations and cloud sensors. With eight built-in relays it allows to control the powering of the observatory's equipment such as telescope, camera, lighting, ventilation. The card has a built-in universal power supply 110 or 230V AC, it can also be powered with a typical power supply of 12V DC. Control of rotary engine and measuring the azimuth of the dome. Control of the single or double shutter engines and providing an information about their current mode. Each of the shutter parts can be equipped with an encoder that measures its position. 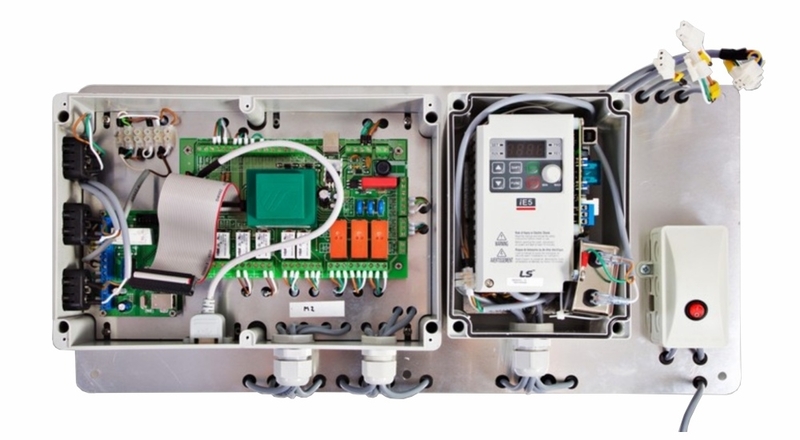 Power control up to eight devices of the observatory equipment. Emergency shutdown of the shutter in the case of power failure in the grid. Emergency shutdown of the shutter in the case of battery power failure. Emergency shutdown of the shutter in the case of bad weather conditions. Emergency shutdown of the shutter in the case of loosing the connection with the control computer. FindHome – searching for HomeSensor position. Remembering the position of the dome after power off. Supporting the rain and cloud sensors. Safe Observatory input to hardware blocking the action of engines. Displaying basic informations about the status of the observatory's sensors. Measurement of internal and external temperature, measurement of humidity and atmospheric pressure. Measurement of current-voltage batteries, which supply the dome. The internal card remote firmware revision procedures, without being physically present at the observatory.